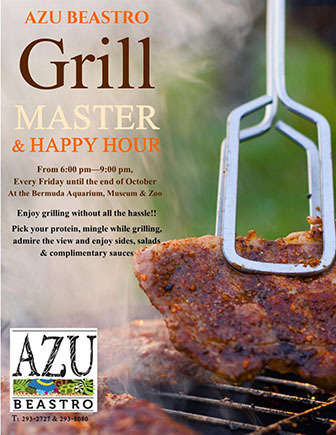 The Bermuda Aquarium Museum & Zoo invites all to join them for ‘Grill Master & Happy Hour at AZU Beastro’ on Friday, July 14. From 6.00 pm until 9.00 pm at the AZU Beastro inside BAMZ in Flatts Village, the whole family can enjoy an evening of grilling with spectacular views of Harrington Sound and a playground where kids can play. Grill Master is the new concept the restaurant has introduced to their Happy Hour. Anyone can act as the ‘Grill Master’ for their group, and cook the food to their liking. An array of meats and seafood will be available to grill, as well as a salad buffet, sides, and complimentary sauces & condiments. There is no cover charge for this event. For more information, contact AZU Beastro at 293-8080 or Andy Dezter at 236-6517. “An array of meats and seafood will be available to grill…” , poor animals and fish cringing in their enclosures wondering if they will be next.